These aluminum registers are made by Classic Grilles here in the USA and all by hand. 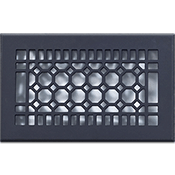 The wall air vents are sand cast and are made with a 1/4" thick faceplate to ensure a quality product. Order your aluminum registers with either a painted brown, black, white or bare finish. If the wall air vent is left in bare aluminum, a clear lacquer will be added to the product for protection. Aluminum registers will not rust but are made with an adjustable metal diffuser which allows you to close off the airflow when needed. Octagon wall air vents can also be installed into the ceiling by mounting with the screws provided with each order. Tip: The aluminum registers are listed by size of your ductwork opening. An 12 x 4 inch hole will need a 12 x 4 vent. The wall air vents will have an additional 2 inches added to the outside faceplate. Measurements between sizes can vary since they are all handmade. Important: Our aluminum registers will take between 7 to 9 weeks to make and then ship out. These Octagon wall air vents are considered special order, non returnable and cannot be canceled once a payment has been received. Classic Grilles aluminum registers can be found in multiple styles to match any home or style. Order an Octagon wall air vent without the damper for return air needs. Place an order for all your aluminum registers today to save time and money on shipping!